Kimberly Kay (Neuendorf) Paulsen was born on October 1, 1957 in Waterloo to Milton and Marlyn (Lobeck) Neuendorf. 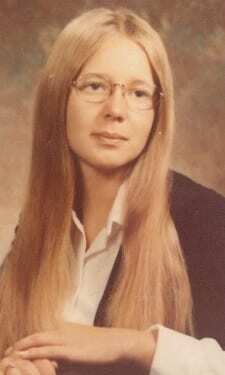 She attended school in Evansdale and graduated from East High School in 1975. She married the love of her life, Joseph Michael Paulsen Sr. on November 6, 1976 at Prince of Peace Church. The couple welcomed two beloved children into their lives. Kim worked in various positions during her life. She was the executive secretary at Waterloo Industries, over sought accounts payable at Iowa State University, and was the library assistant at Excelsior Springs Missouri High School. The family also moved various times, living in Cherokee, Le Mars, Nevada, Evansdale, and lastly settling in Galesburg, Illinois. Kim enjoyed various crafts including remodeling, painting signs, and making soaps and lotions with essential oils. Kim and her family were also life long, passionate members of Price of Peace Church. Doing crafts and playing with her four grandchildren also brought Kim great joy. Kimberly Kay (Neuendorf) Paulsen died on Friday, October 19, 2018 at St. Francis Medical Center of Peoria at the age of 61. She is preceded in death by her father; both sets of her grandparents; and many aunts and uncles. Kim is survived by her husband of almost 42 years Joseph Paulsen Sr.; her mother; a daughter: Melinda (Joseph) Wilmer of Cedar Falls; a son: Joseph (Stephanie) Paulsen Jr. of West Liberty; two sisters: Nancy (Mike) Carper and Linda (Roland) Armstrong, both of Waterloo; and four grandchildren: Alex and Anthony Wilmer and Shea and Rhys Paulsen. If a Death Has Occurred or is Imminent, Please Call 319-232-3235 for 24-Hour Immediate Assistance.